I have wanted to come to Armenia for many years, partly because I am half Armenian and I am not sure whether there is another reason. Here is the short version of Armenia’s story. It is a democratic republic of about 3 million people. It sits between two edgy neighbors — Russia and Turkey — that have been fighting to control it for centuries. The Ottoman Turks slaughtered over a million Armenians about 100 years ago. After World War I, Armenia fought for its independence but ended up as part of the Soviet Union. After the fall of the USSR in 1990, Armenia regained its independence. I like the colors on its flag. I have spent the last two days walking all over Armenia’s capital, Yerevan. 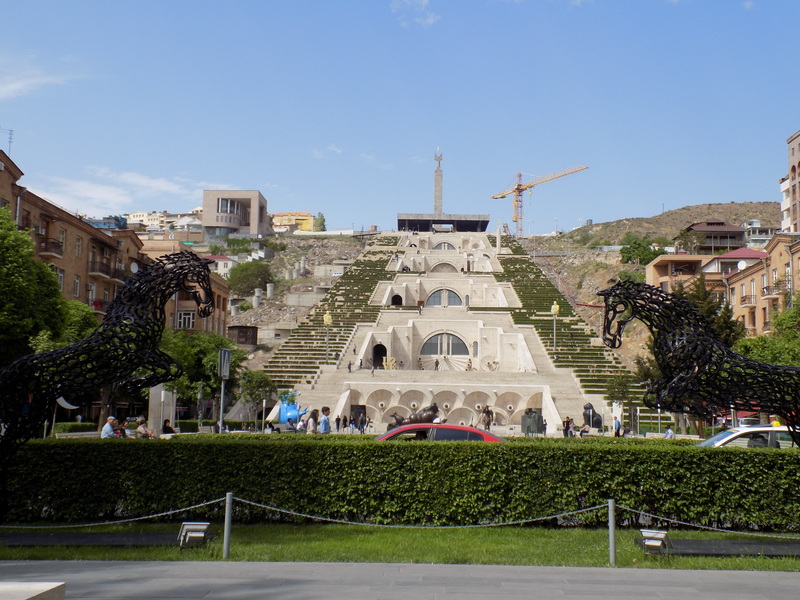 If I had to describe Yerevan in one word it would be “livable,” maybe the most livable city I have ever visited. Here are some reasons why. The city center is walkable. The center sits in the middle of a ring road flanked by green space. Inside, the roads cut across at diagonals and on a grid through pedestrian malls, plazas and small business districts. People are out walking at all hours of the day and everything is easy to reach without a car. Both of my days here, I walked until my feet were killing me, then returned to my apartment and couldn’t wait to go out again. The city center has a million trees and a lot of parks. The city center’s architecture is a little hard to describe. Much of it is Soviet era that appears to have been updated with nice windows and a little architectural detail. Somebody (probably a bunch of people actually) knew that trees are the best way to make a street of so-so-buildings feel good. The city center is just loaded with sycamore, ash, maple and oak trees. 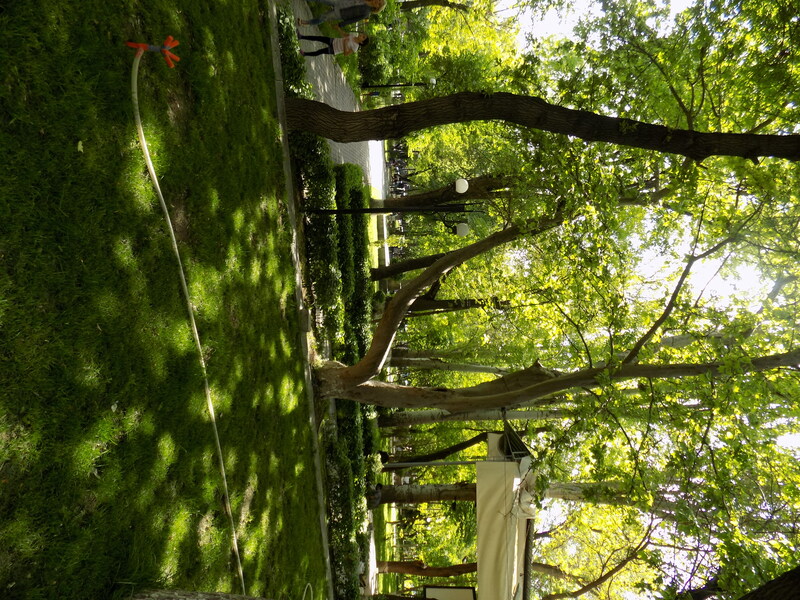 There are also large and small parks all over the city center and people are in them. The Cascade, a monument of 572 steps — I climbed them all. 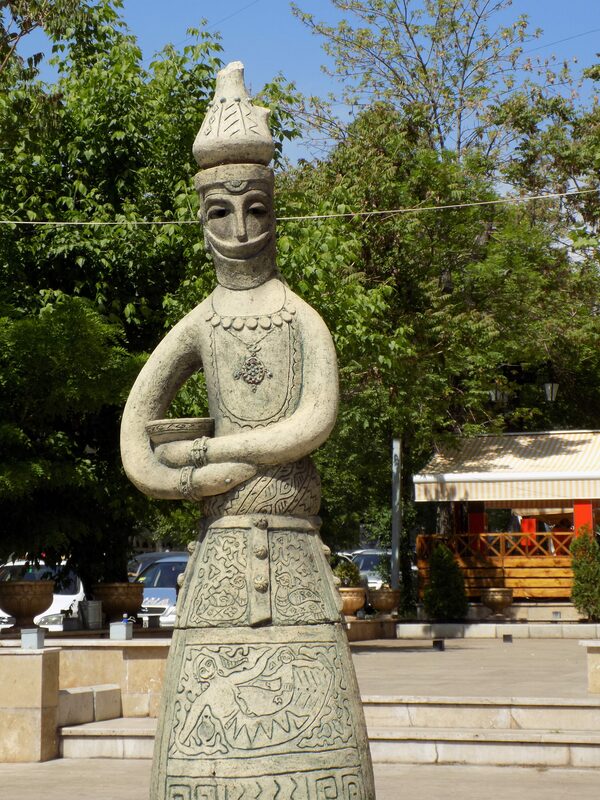 Each level has Armenian sculpture and it is a favorite of lovers and people with energetic children. At the top is a confusing reference to Soviet occupation as well as national independence. I think. The city center has no high rises. Yerevan’s tallest buildings would be lost in a city like San Francisco, and most buildings are less than 6 stories. As a result there is little car traffic and there are no wind tunnels. The city buildings do not overwhelm the landscape or make you feel small as skyscrapers do. Here are a few other superficial observations. One of my favorites at the National Art Gallery. 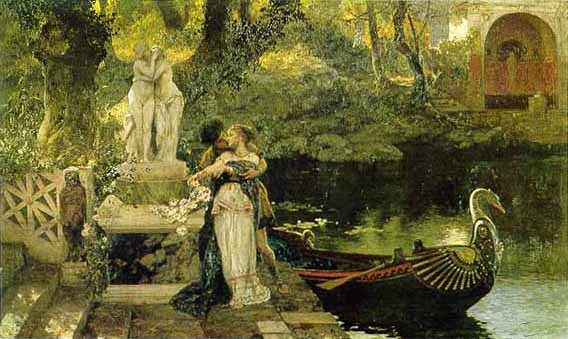 A Russian painter whose name I can’t remember or find. Just a little bit influenced by the pre-Raphaelites. The main museums are pretty good, could be better. The History Museum of Armenia has a lot of interesting displays (I loved the pottery) but I felt I had missed the big picture. The National Art Gallery has a ton of paintings but they are not displayed according to any theme and are not explained. Both museums have hired a ton of women to follow you around and tell you which room you must go into next. Do they think I am going to steal the Kandinski? Why can’t I go back in that other room again? The People are Armenian? 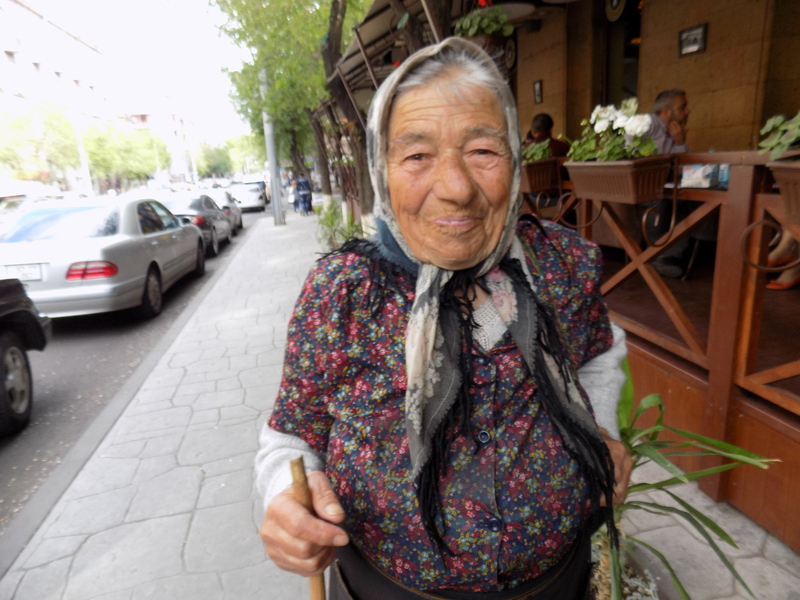 The people of Yerevan mostly look solidly middle class, stylish and thin. Greece is a hard act to follow in the hospitality and cheerfulness department, so the people here seem a little reserved. I thought I had been proven wrong about this when a woman in the plaza started chatting with me in Armenian. When I gave her a confused look, she said “Are you American? You could pass for Armenian!” Of course that started a conversation about my half-Armenian-ness. It turns out she is ethnically Armenian but visiting from California (yes Glendale). Where are all those Armenians from my youth who were not reserved? My only real conve rsation with a local so far was with Magda. Magda was begging for change when I was having coffee at an outdoor cafe. I gave her a few thousand dram and she invited me to take her picture. Then she wanted to talk about her life a little — I couldn’t understand much but I think I understood that she is homeless and occasionally lives with her brother. She has not always been destitute. 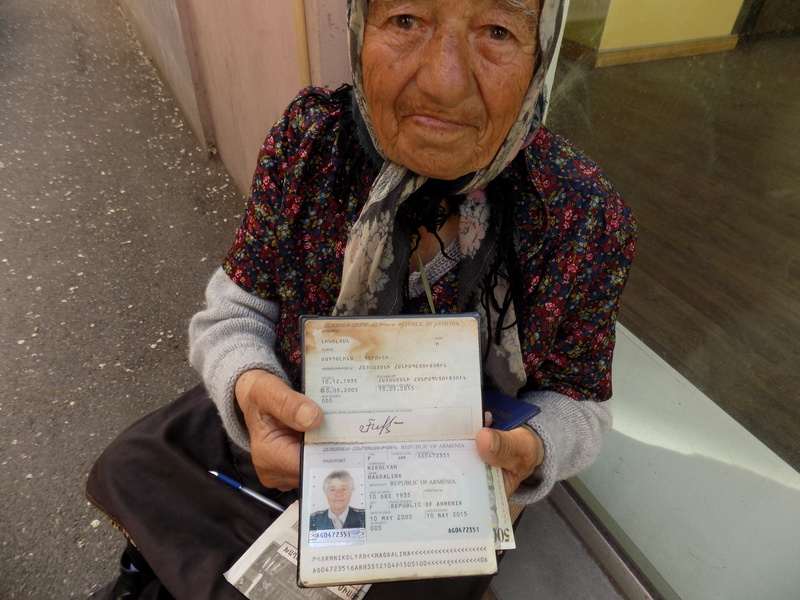 She showed me what I originally thought was her Soviet-era passport. But it expired last year. In the passport photo she looks like a lawyer or an accountant. What happened in her life?. She was lovely. I will look for her again tomorrow. Yerevan is so nice but I am surprisingly not quite emotionally connected to this country, the homeland of my beloved grandfather. I think I still haven’t disconnected from my last country. Nothing better than walking around to get yourself familiarized and settled into a new city!. Looking forward to hearing about your future adventures with Magda and others. P.S. Notice the resemblance of the first pic in this post and my treasured figurine you so often steal from my house? I will immediately notify the Armenian authorities to post security forces around the statue to prevent it from disappearing. Yes and Budapest and NYC and Amsterdam and and and…..